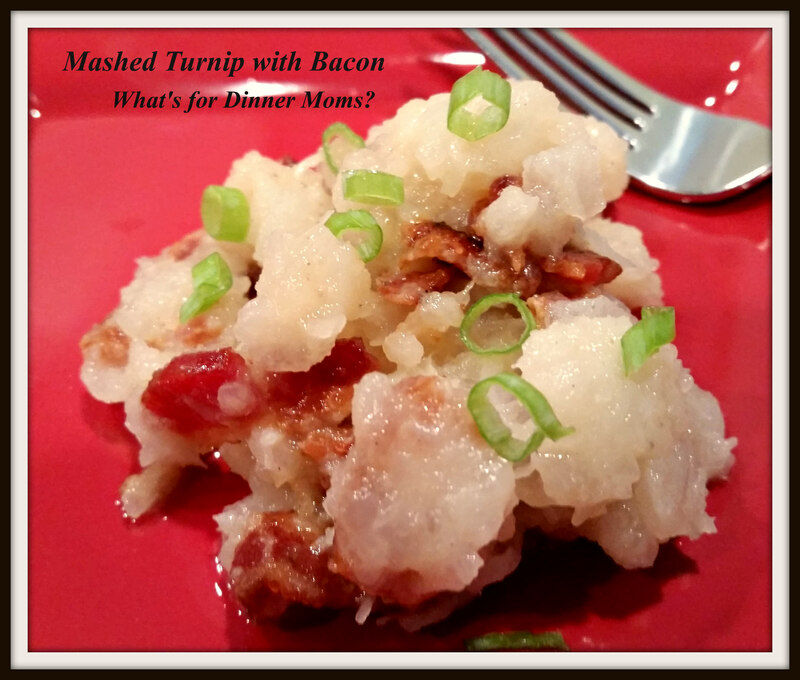 Mashed Turnips with Bacon – What's for Dinner Moms? I am not a fan of vegetables. Let me rephrase that, I am not a fan of some vegetables. I am getting better bit by bit. I still struggle with squashes and root vegetables but am learning if they are well seasoned or even roasted in some cases they are not so bad. Turnips are one I have really struggled with. We have received some in our CSA box the last two weeks so it was now time to figure out how to cook them so I could eat them. Roasting was okay but still not very good. I even thought of the American Girl movie “Molly” where the mother adds a bit of butter to fry the mashed turnip in with a bit of sugar. I haven’t tried that yet but it may be next. This was a heaven parting, “Alleluia”, we all loved this dish. My family could not get enough of them. In fact the pan was empty before the plates were even served because everyone wanted a little bit to “taste.” I ended up just serving some to everyone before dinner. Seriously. If you don’t like turnips but like bacon, this is the way to cook them. So easy. The hardest part is cooking the bacon and not eating the whole thing. Boil turnips in a pan of water that has been salted. Boil until turnips are fork tender. Drain turnips and mash with butter, garlic powder, salt and pepper. Add crumbled bacon and 2+ tablespoons of rendered bacon fat. Stir well. Taste and adjust spices as necessary. Serve warm with a sprinkling of green onion, if desired. We didn’t get any this week but I am sure there will be more! Thank you! I love turnips! My grandmother would always fry them in bacon fat as well, mash them, and mix them with sauteed onions. Its the best way to have them!!! It certainly is! I usually barely choke them down and the kids picked them out when I roast them. We were all happy! I agree totally. I have been round and round with sweet potatoes and still don’t like them even 70 percent. I have however conquered radishes and love them. Now I am trying to find ways to like acorn squash and butternut squash. Good luck with your ‘not so favorites”. I like acorn squash if it is cut in half, Roasted with some butter on the cut side and then a scoop of cottage cheese on top once it is cooked. Sounds weird but we like it. I am with you on the sweet potato thing Gina! The only time I “moderately” enjoyed them was at a restaurant and they were fried in duck fat and had some fancy truffle salt sprinkled on them. It really was! I mean, for a sweet potato, lol. Thank you! Hope it is a hit! They’ll drool over the bacon! Ha! When I eat turnips I just think, “it’s just like potatoes, it’s just like potatoes…” To try and get myself to eat them! Lol. But they don’t taste the same. The bitterness gets me. Very true. I usually don’t eat them solely by themselves, usually roasted with other veggies. This looks like a spectacular way to eat them, though! I am also with you on the turnip thing. Perhaps the bacon is the key! For us it worked. It added lots of flavor and didn’t seem as bitter.